A ground-breaking treat for mystery and music lovers, the audiobook of Elias's first novel, Devil's Trill introduced a new kind of listening experience, with violin performances by the author providing clues throughout. 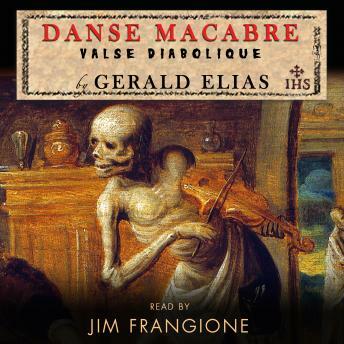 Now acclaimed author/violinist Gerald Elias is back, bringing more music to his gripping second novel in the Daniel Jacobus mystery series, Danse Macabre, also narrated by Jim Frangione. Just after his Carnegie Hall swansong and before his imminent departure for retirement in France, beloved violinist and humanitarian Rene Allard is brutally murdered with a mysterious weapon. His young African American rival, crossover artist BTower, is spotted at the scene of the crime hovering over the contorted body of Allard with blood on his hands. In short order the aloof and arrogant BTower is convicted and sentenced to death, in part the result of the testimony of blind and curmudgeonly violin pedagogue Daniel Jacobus, like millions of others, an ardent admirer of Allard. Justice has been done...or has it? Jacobus is dragged back into the case kicking and screaming, and reluctantly follows a trail of broken violins and broken lives as it leads inexorably to the truth, and to his own mortal peril.